Noctilucent Clouds The southern season for NLCs has come to an end. The last clouds were observed by NASA's AIM spacecraft on Feb. 20, 2015. Now attention shifts to the northern hemisphere, where the first clouds of 2015 should appear in mid-May. Come to Tromsø and share Marianne's passion for rural photography: Chasethelighttours.co.uk invites you to experience "Heaven on Earth" with an aurora, fjord, fishing, whale watching, photography or sightseeing tour. 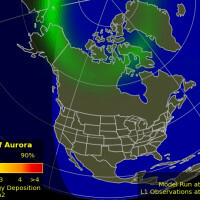 DECREASING CHANCE OF STORMS: NOAA forecasters have downgraded the chance of geomagnetic storms today to 35%. A CME expected to hit Earth's magnetic field on April 22nd has either missed or it is approaching much more slowly than expected, setting the stage for a very weak impact. 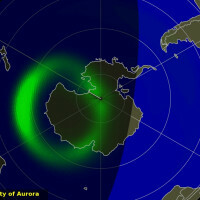 Aurora alerts: text, voice. Researchers have long known that volcanic eruptions produce strong lightning. Findings published in a 2012 Eos article reveal that the largest volcanic storms can rival massive supercell thunderstorms in the American midwest. But why? Volcanic lightning is not well understood. Lightning is nature's way of correcting an imbalance of electric charge. In ordinary thunderstorms, one part of a thundercloud becomes positively charged, and another part becomes negatively charged. This charge comes from collisions between particles: e.g., droplets of water and crystals of ice rub together, creating static electricity in much the same way as woolen socks rubbed against carpet. Lightning arcs between charge-separated regions. Something similar must be happening inside volcanic plumes. One hypothesis holds that catapulting magma bubbles or volcanic ash are themselves electrically charged, and by their motion create charge-separated areas. Another possibility is that particles of volcanic ash collide with each other and become charged through triboelectric rubbing. In short, no one knows. It is a beautiful and terrifying mystery. 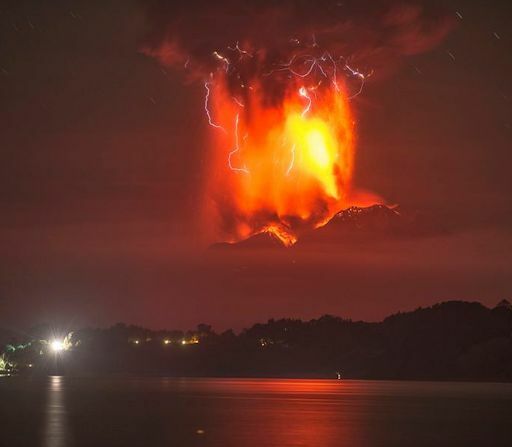 Stay tuned for more images as the eruption of Calbuco continues. "It was a fantastic eruption," says Tosi. 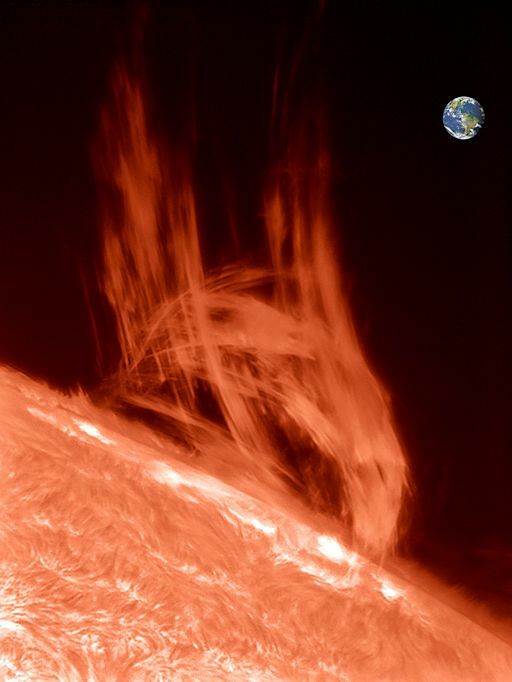 "We are having a very active sun this week," agrees Jett Aguilar of Quezon City, the Philippines, who photographed two huge prominences yesterday. Bill Hrudey saw even more from his observatory in the Cayman Islands. The face of the sun is peppered with sunspots--but none of them is active today. Astronomers with backyard solar telescopes are encouraged to monitor the edge. That's where the action is. Solar flare alerts: text, voice. 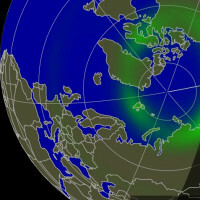 On March 17th, during the strongest geomagnetic storm of the current solar cycle, the students of Earth to Sky Calculus flew a Space Weather Buoy to the stratosphere. Along with radiation detectors and other sensors, the payload carried packets of brewer's and baker's yeast. En route to the stratosphere, the microbes experienced temperatures as low as -63 C and cosmic ray doses 40x Earth-normal. To support the students' research, Eileen Weingram bought a packet of the baker's yeast. "It made a huge loaf of bread," she says. "Very yummy." 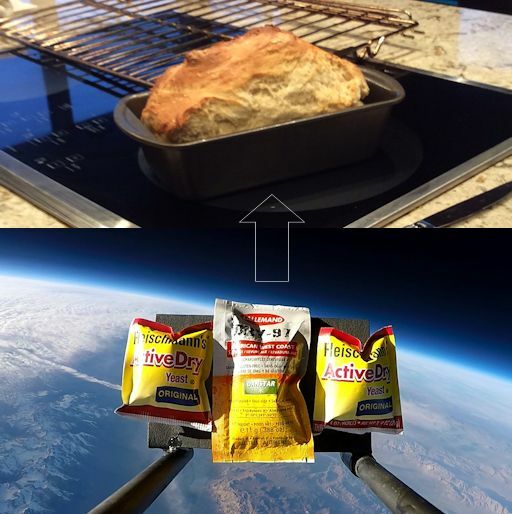 If this story whets your appetite, you can bake some "space bread" of your own. Packets of yeast are still available for only $49.95. Contact Dr. Tony Phillips to place your order--and let the baking begin! All sales support high altitude balloon flights to measure the effect of solar storms on Earth's atmosphere. On Apr. 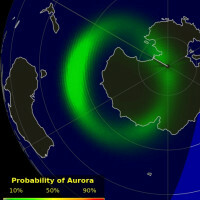 23, 2015, the network reported 33 fireballs. On April 23, 2015 there were potentially hazardous asteroids.